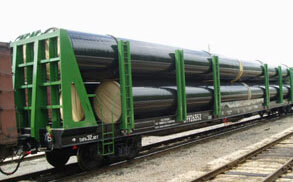 Tank railcars are used for transportation of edible and non- edible liquid cargo, liquefied gases and powdery materials. There are tank wagons for transportation of petroleum products, liquefied gases and for other chemically active liquids, also wagons for transportation of water, milk and syrup. 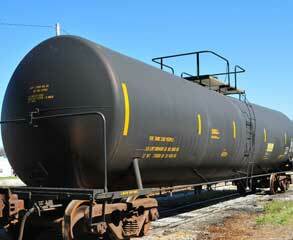 Usually the capacity of tank railcars is 60, 120, 125 tons. 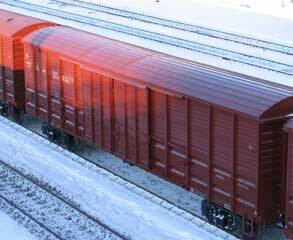 Covered railcars (universal and specialized) are used for transportation of various types of cargo: bulk- packaging, piece, bulk cargo. Carrying capacity of 68-71 tons in 4-axle wagons and 120-132 tons - at the 8-axle, volume - 120-138,0 m3. Loading-side. Hoppers are used for transportation of bulk cargo, fertilizers, minerals and grains. 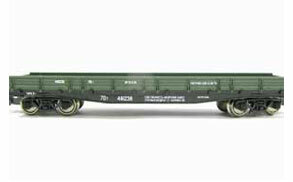 There are open and closed hoppers with loading hatches on the roof. Choosing the right hopper for transportation, depends on the nature of cargo. Payload capacity - 70 tons, volume - 60-72m3, 81-87m3. Loading and unloading operations are carried out with special equipment on top. Flat railcars are used for container transportation, transporters, timber platforms and pipe trucks for transportation of long measuring cargo. 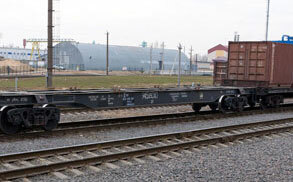 Universal flat wagons are used for transportation of goods of various characteristics. Platform length - 13,4m, 71t load capacity. Equipped with a platform folding side and end boards. The containers and vehicles are transported on specialized platforms having special equipment for ultra-reliable fastening of cargo. Load capacity - 60-75 tons, the length of the platform from 13-14m to 18-22m. Including flat wagon for transportation of pipes and containers having a capacity of 59.5, 62, 66 tons, length - up to 26m. The ability to transport pipes of 18m length. Flat railcars for transportation of timber with a loading capacity of 67-68 tons. Length - 13,4m. A well car/stack car is used for transportation of large-capacity containers. 40-ft platforms are used for transportation of two 20-ft containers or one 40-ft container (load capacity - 60-75t). 60-ft platforms for one 20-ft and one 40-ft container (load capacity of 60-72 tons). There are also 80-ft flatcars on which it is possible to transport 2 standard 40-ft containers (with load capacity - 68, 69.5, 72t.) A well car/wagon/stack car for transportation of tank containers IMO type 1, IMO 2, IMO 5, load capacity - 69T., The length over coupler -26,2m. All loading-unloading operations on any type of flat wagons are carried out by professionals with special technique. 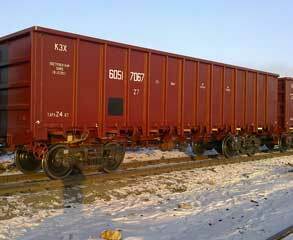 Open-box railcars are used for transportation of bulk cargo, pipes, timber and lumber. They are covered with a tent or tarp on top. Loading operations are carried out by special equipment from the top. Unloading operations- through hatches in the floor in case of bulk cargo. Carrying capacity - 71t.,Volume -75.2 m3. 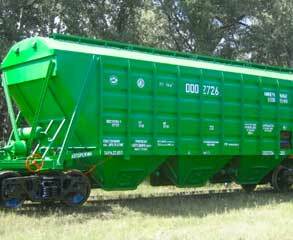 Including the railway platform wagon with sides - dump-car (tip truck) - for transportation of bulk cargo (coal, soil, sand, gravel) density of 1.8-1.9 m \ m2. The length of the wagon along coupler- 13,4m, 14,9 m, up to 17,6m, width - up to 3,5 m, the volume of the body - up to 70 m³, load capacity: 60-65 tons (4 axle wagons), 100-105 tons (6-axis), 145 tons (8-axis). Loading operations are carried out by excavators with bucket capacity of up to 12,5 m2. Automated unloading is carried out by tilting the car body, and reclining the boards.